I have to admit, when I first saw a thumbnail of this book online, my immediate thought was “why is this guy delivering a platter of ice cream on a bike in costume?” A question that sadly, was never answered by this book. 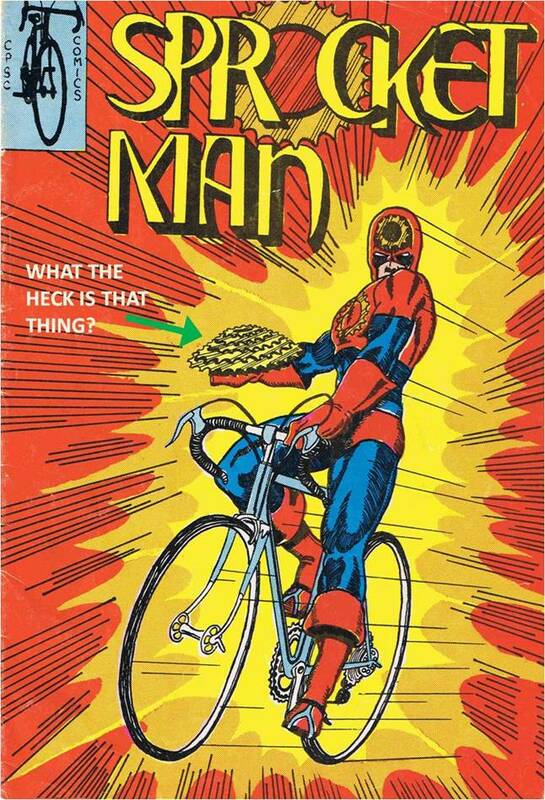 I’m guessing that the thing on Sprocket Man’s arm is not an oddly drawn dessert, but a giant sprocket – the piece of metal that bike pedals and chains are attached to. 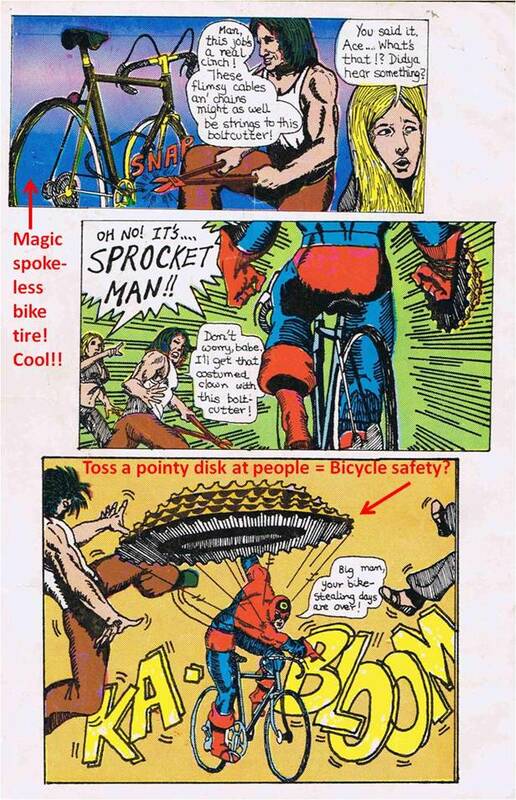 Guess that would explain our hero’s name – except nowhere does anyone in the book actually say that it is a sprocket. So, you know, feel justified to use your imagination as I initially did. Gripping story so far, isn’t it? 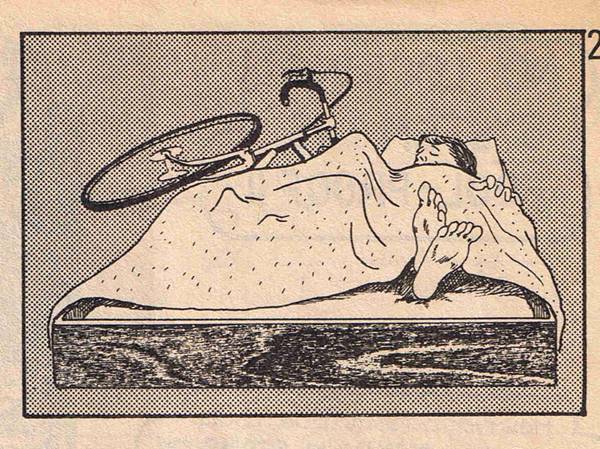 Sigh… looks like this is actually a safety pamphlet issued by the government to discuss bicycle safety. Which is fine, it’s an important issue. 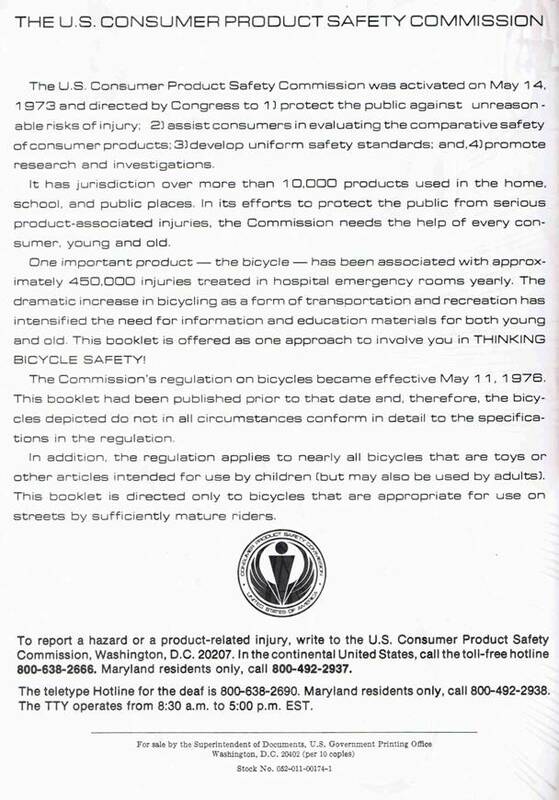 I’m sure adults everywhere enjoyed being given this issue to read when buying that new bicycle back in the 1970s. I know nothing would hold my attention more than a black and white pamphlet narrated by a guy delivering a baked Alaska. 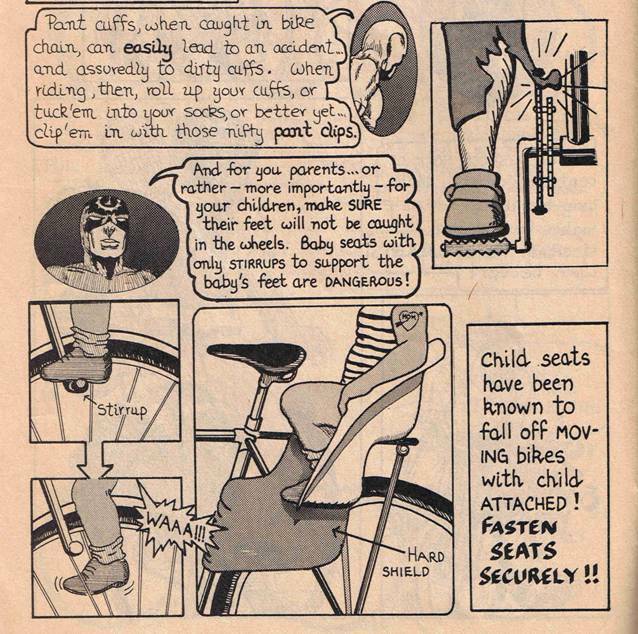 Rather than wait until the regulations passed and THEN publish an up-to-date book, the government body decided to CONTINUE publishing an out-of-date safety pamphlet. But that’s okay because THEY WARN YOU THAT THEIR SAFETY PAMPHLET IS ALREADY OUTDATED!!! Standing perfectly still when surrounded by bicyclists. 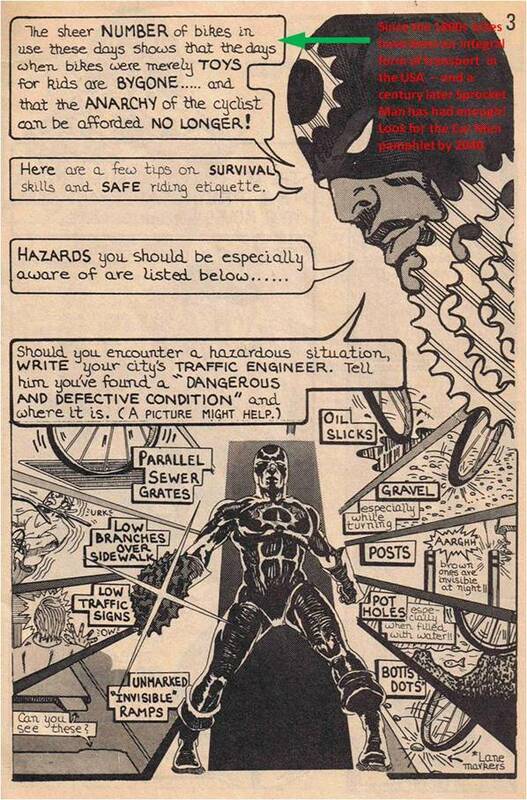 Of course buddy here is about to get smashed by the bike behind him as the arrow clearly points out. So, you know, good strategy. 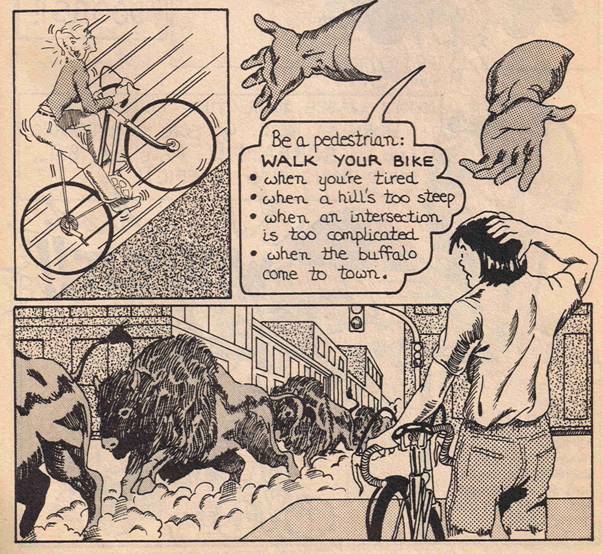 Walking your bicycle when the buffalo are stampeding. Wait, that makes no sense. 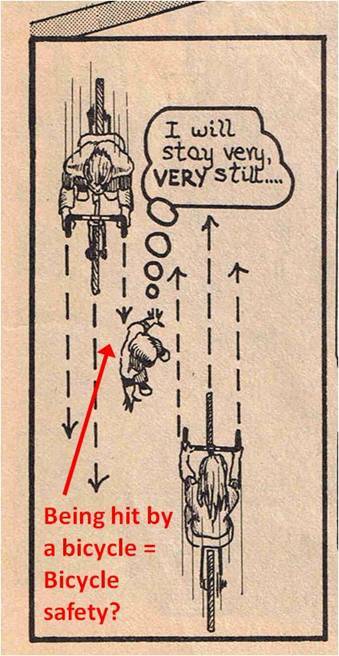 If you were about to be trampled, wouldn’t you get on your bike and get our of there as fast as you possibly could? Why the hell would you stop and walk your bike?? 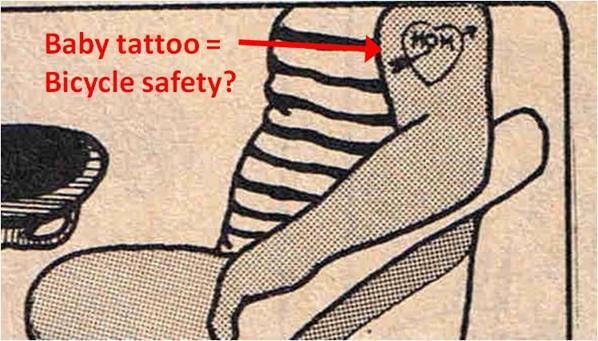 Does that baby have a tattoo??? Dude seriously needs a girlfriend. 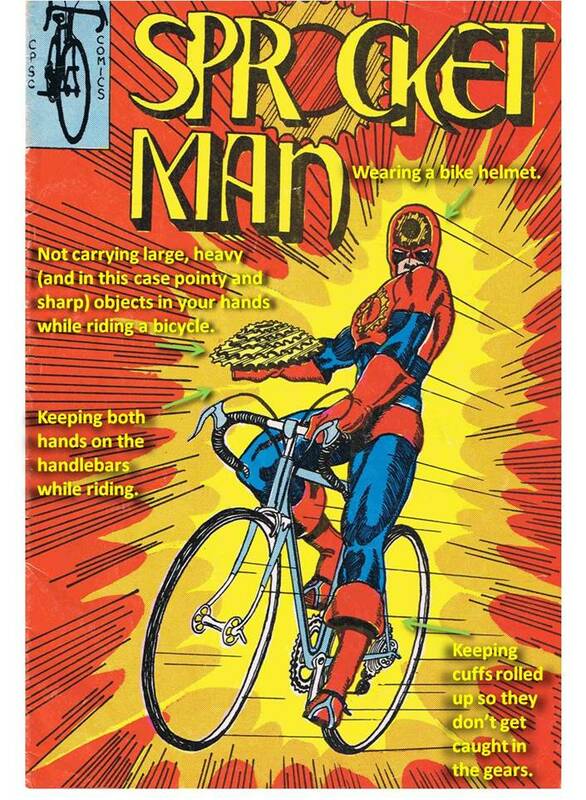 Man on bike action – just – plain – weird. So, things certainly got strange in a hurry, didn’t they? The fact this was issued by the government makes it all the more interesting. Yes, Sprocket Man, you are truly the greatest government sponsored hero I’ve ever seen. Long may your example inspire the bike riding public!